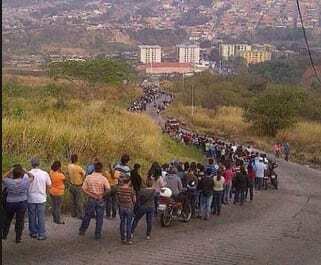 Despite its oil riches, Venezuela has joined the ranks of North Korea and Cuba in rationing food for its citizens. The government has rolled out a system using fingerprint scanners to limit purchases of basic goods. Before entering grocery stores, shoppers have to scan their fingerprints to make sure they don’t buy more than their fair share. The country is turning to rationing because of shortages caused by a mix of unproductive local industries and a complex currency regime that’s unable to provide the dollars importers need to pay for basics. Many Venezuelans are infuriated by the program, saying it creates tiresome waits, doesn’t relieve shortages, and overlooks the economic overhauls the country needs. The tumbling price of oil is likely to mean even more scarcity ahead, economists say. This entry was posted on October 23rd 2014 at 9:49am/09:49 and is filed under Business, Live News Column 1, World News. You can follow any responses to this entry through the RSS 2.0 feed.